Doon International Education Society was established by Mr DS Mann, the Founding Chairman, in the year 1993 with a vision to provide affordable quality education. Mrs MS Mann took it upon herself to give practical shape to this herculean task by heading Doon International School, Dehra Dun as its Founding Principal. 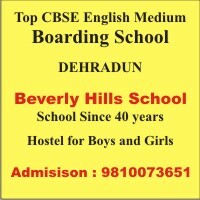 The school was started from ‘Pari Mahal’ in Dalanwala, Dehra Dun in the year 1993. By dint of their professionalism and unstinted efforts the school was able to realise a student strength of 500 in it’s very first year of operations. Today that seedling planted by The Founders has grown to become a renowned education institution of the country. Doon International School today is a name to reckon with as one of the top boarding schools and has constantly been ranked the NO. 1 CBSE co-educational, day and residential school in Uttarakhand (source - Educational World). This success was followed by setting up another Doon International School at Mohali, Punjab in the year 2004. Doon International School Riverside Campus has since been established by The Founders in the Year 2015 to provide world class education in a pollution free environment where the future generations of tomorrow can be prepared and equipped with all the requisite skills necessary for the children to become capable and responsible world citizens. Riverside Campus has already set a benchmark by being recognised as the No 1 Emerging High Potential School in India, by Education World.